Average Weight	: 50 - 70 lbs. This is possibly the oldest of all the French shepherds, arriving in Picardy and the Pas de Calais with the Celts in AD 800. 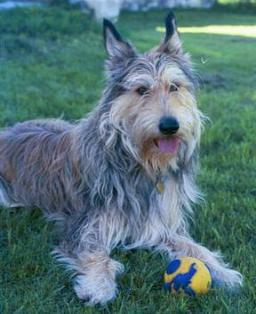 The Berger Picard is named for the Picardie region in northeastern France. Some experts insist that this breed is related to the more well-known Briard and Beauceron, while others believe it shares a common origin with Dutch and Belgian Shepherds. Although the Berger Picard made an appearance at the first French dog show in 1863, the breed's rustic appearance did not lead to popularity as a show dog. The two World Wars nearly caused the extinction of the Berger Picard and it is still rare. In France there are approximately 3000 dogs and in Germany approximately 350 of this breed.